On Saturday morning I was sitting alone on the shoreline at Urangan at the entrance to the vast Hervey Bay in Queensland. On that very morning 150 years ago, a migrant ship, the David McIver, entered Hervey Bay carrying 404 immigrants, there having been only one death but also nine births on the 107 day voyage from Liverpool. Included in the passenger list were Annie Brennan, my great great grandmother, a young widow of 40 years with her five children, one of whom Martin was to become my great grandfather. Hervey Bay is an expansive but shallow bay sheltered from the Pacific Ocean by the majestic Fraser Island. On 6 July 1863, the David McIver spent the day searching for a channel until it was anchored in four fathoms of water. Some of the crew got into a small boat and made for the shore at Urangan close to where I was sitting 150 years later. They came ashore and found two Aborigines. I presume they were males. Those two Aboriginal men without protest accompanied the crew in the boat and showed them the way to Captain Jeffrey's Admiralty Survey Camp. The David McIver was only the second migrant ship ever to come into Hervey Bay and here were two Aborigines happy to extend a helping hand to complete strangers who must have looked very strange indeed. 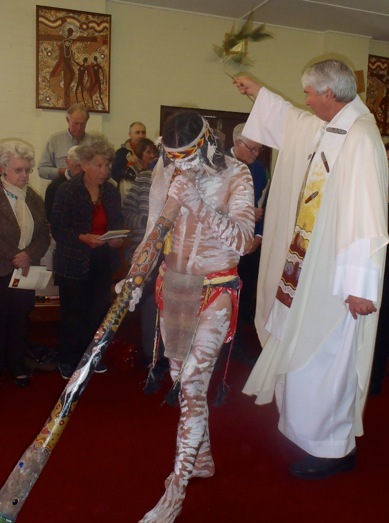 One Aboriginal was then commissioned to send word to Maryborough 40km away. That Aboriginal walked and ran all through the night to bring word of these new arrivals. A pilot was then dispatched. Within two days, a steamer named Queensland arrived, towed the David McIver to White Cliff on Fraser Island, and then received the disembarking passengers to transport them up the Mary River to the port of Maryborough where they arrived on 9 July 1863. These Aborigines who helped my ancestors and their fellow passengers carried neither purse nor bag nor sandals. They extended the hand of peace and welcomed the stranger. Many on the David McIver were eligible for land grants from the newly established Queensland Government. That was the lure for their coming to the other side of the world rather than the United States. Who'd have ever thought that one of Annie Brennan's great grandchildren, my father, would have been one of the judges who just 21 years ago in the Mabo case said that Aborigines had always owned the land which had been subject to those gratuitous land grants? Neither Annie's descendants nor the traditional owners and their descendants have ever had cause to wipe the dust from their feet and go elsewhere. Over time we have committed ourselves to living in justice and peace. Next month we will mark the 50th anniversary of the presentation of the bark petitions to the Australian Parliament by the Aborigines at Yirrkala in Arnhem Land on 14 August 1963. Back in November 1935, the Reverend Wilbur Chaseling, a Methodist Missionary arrived at Yirrkala with his family and fellow missionaries. They were the first Europeans to settle in that part of the world. They too came without purse, bag or sandals. They came with a greeting of peace and co-existence. They did not move around from place to place. In the early 1960s, a foreign corporation wanted to come and mine the Aboriginal lands there at Yirrkala. The missionaries, without consulting the Aborigines, indicated to government that all would be well. But the Aborigines on getting wind of what was proposed were very upset. The missionaries then did the right thing and worked closely with the Aboriginal leaders deciding to petition the Australian Parliament asking to be consulted before there was any invasion or interference with their hunting and traditional places. In a graceful understatement, they told Parliament, 'That the people of this area fear that their needs and interests will be completely ignored as they have been ignored in the past, and they fear that the fate which has overtaken the Larrakeah tribe will overtake them.' The Larrakeah were the traditional owners of Darwin and the elders from Yirrkala had seen the social devastation caused the Larrakeah people living on the outskirts of Darwin. The Yirrkala Aborigines in 1963 could not have petitioned Parliament on their own. The missionaries were there with whitefella knowledge to provide a helping hand, having learnt and repented from their earlier backroom discussions with government. The missionaries did not have cause to wipe the dust from their feet. They hung in and accompanied the traditional owners as they pleaded their case for justice with the authorities in Canberra. During NAIDOC week we reflect that there is still so much to be done so that Aboriginal Australians might enjoy a place at the table without adverse discrimination and with the assurance that they may flourish. Addressing the Parliament in 1963, the people of Yirrkala said, 'And your petitioners as in duty bound will ever pray God to help you and us.' Given the state of affairs in Canberra, let's all say 'Amen' to that as we face an interminable election campaign with politicians pretending to wipe the dust from their feet with declarations that the day will be more tolerable for Sodom than for our towns like Yirrkala and Urangan. Like the Aborigines at Urangan, let's extend the hand of friendship to the complete stranger. Like the petitioners at Yirrkala, let's hope that our better instincts will prevail even against wealth and power. Fr Frank Brennan SJ is professor of law at Australian Catholic University, and adjunct professor at the College of Law and the National Centre for Indigenous Studies, Australian National University. 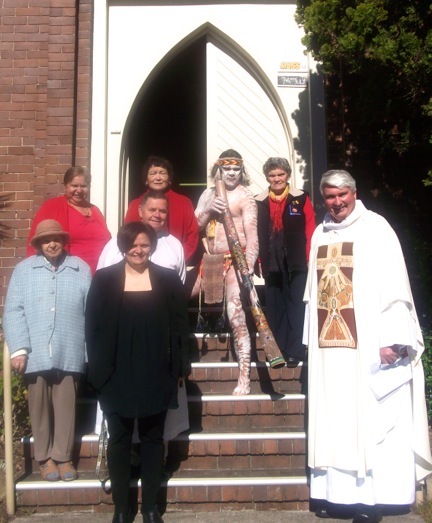 Text and images taken from the Mass to mark the start of NAIDOC week on Sunday 7 July 2013, at Reconciliation Church La Perouse. This is an edited version of Fr Brennan's homily. In honour of NAIDOC week, this is a translation of a twentieth-century Aboriginal song: Spinifex Country/Here we all are,/We are all walking,/In this spinifex country. Frank , thank you for giving this reminder that we have had a clear message in the Gospels, how to respect difference and to see God in other. This history is a record of a strong and hospitable culture., and as I still experience this same happy inclusion from the First People of this great land ,,I join in your wish and Prayer that we late arrivals will be informed and support the justice and truth needed for peace in this wonderful land. 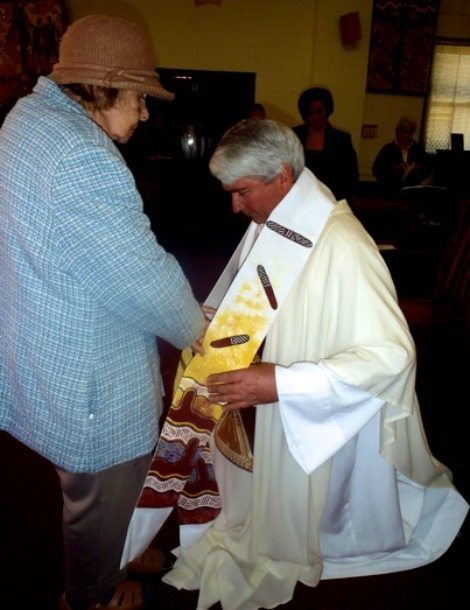 Thank you, Fr Brennan, for this interesting and touching piece. If only this could be broadcast to 'the many' - but would they listen or even recognize the depth of meaning and history? Thank you Fr Frank for your story about your family connection which always adds so much more meaning. A great article Frank. I didn't know that land grants were still being made to British immigrants, in any part of Australia, in the 1860's. Coincidentally the last FORCED emigration from Britain took place in 1860 from Campelltown Loch .in the north of Scotland, with a shipload of highlanders, forced from their bothies and despatched to Canada having made way for the sheep runs of the Highland Clearances. Add to this setting the ending of serfdom in Russia in 1861 and we are presented with a coinciding set of events, both European and colonial, which defy analysis..........And what a woman must Annie Brennan have been! When I want to hear honest talk of what is and what can be in Australia, when I wish to hear something of the real bone and character and possibility of your nation from afar, I read Frank Brennan. I have never yet read a specious, selfish, or silly remark from Frank. I do hope Australians understand what a resource the man is. Thanks.